Don’t worry, you won’t starve. 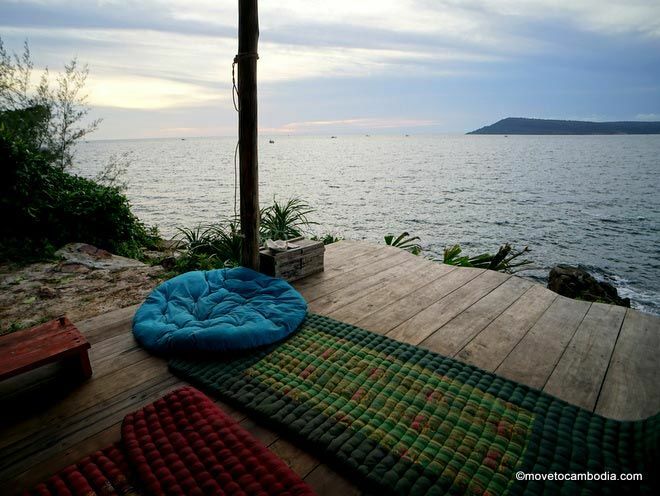 Koh Rong Sanloem is not known for its wide range of culinary options, but depending on where you end up staying on the island, you’ll have at least a few choices. 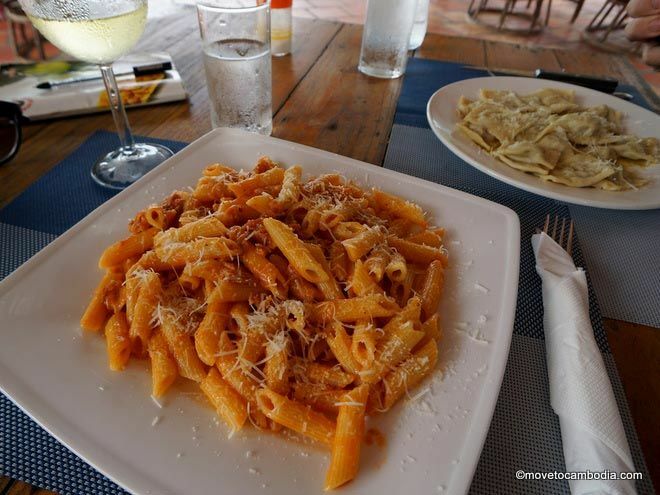 Authentic Italian food on Koh Rong Sanloem? Yup. Cita Resort has some of the best food on this part of the island, and that’s thanks to the Italian owner, who has created a menu that features a range of pastas, including fresh ravioli and tortellini. They serve wine by the glass and make a pretty good negroni, which is a nice complement to the gorgeous sea view. Cita Resort also has a daily fish and seafood special based on what’s fresh and available. The One Resort is the highest-end eatery on the island, with a proper bar and restaurant that serves a range of dishes from Europe, Cambodia, and Thailand in the $8-to-$10 range — we thought the Thai food was good and the pizza was decent. The bar overlooks the illuminated blue pool and serves cocktails priced between $4.50 and $6 as well as wine and, if you’re looking to splash out, Moet Chandon champagne. Welcome to the Moonlight mothership. 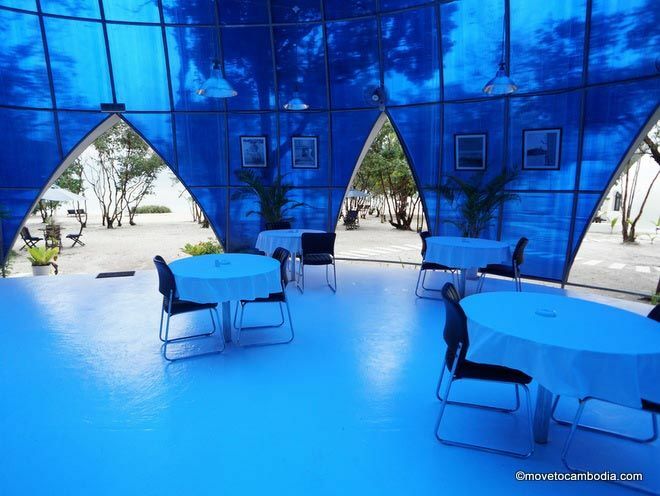 Moonlight Resort’s impressive and slightly bizarre-looking blue dome in the middle of their beachside property is home to the Blue Moon Restaurant and Bar. Bathed in blue light, the restaurant has a beamed-up-to-the-mothership ambiance. Blue Moon claims to be the best restaurant on Koh Rong Sanloem, and we’ve heard great reviews, but our experience there was terrible, both in terms of food and service, so we might stick to just having drinks. Paradise Villas has a very nice bar and lounge that’s an excellent spot for a sundowner. Low tables, chilled-out music, pillows to laze on, and views of the sea…a trip to Paradise might end up lasting longer than originally intended. 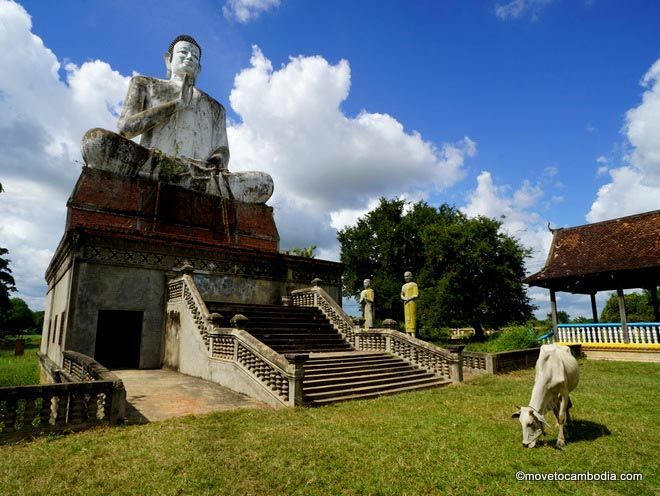 They serve a menu of Khmer and European dishes, as well a selection of reasonably priced wines by the bottle or glass. During high season, Sweet Dreams and several of the other Saracen Bay businesses have inexpensive beachside BBQs. In the middle of Saracen Bay you’ll find Sunny Bar, the only bar on Saracen Bay that’s not attached to a guesthouse. Owned by Sunny, a Cambodian who used to work at the Dive Shop next door, the bar is a great place to stop and have a drink — be it a fruit smoothie (they make their own yogurt) or a beer. 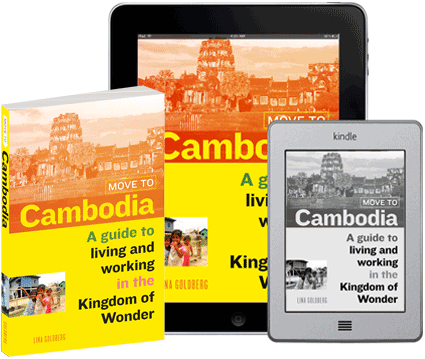 Klangs go for $0.75 and Cambodia beer is $1, which is less than you’ll pay in Phnom Penh. 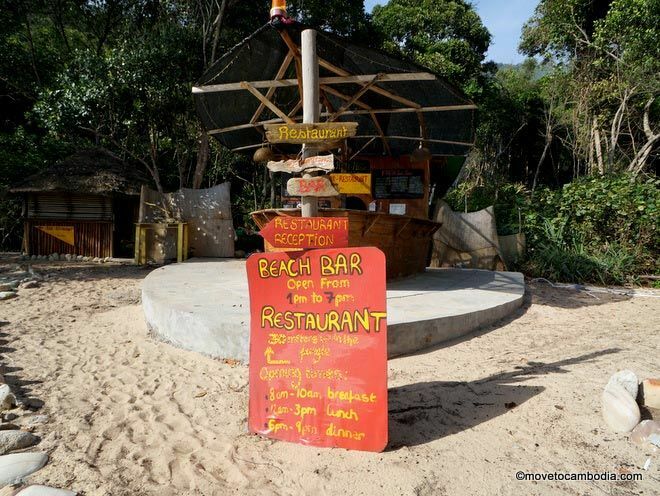 There are more options for eating and drinking in M’phey Bei than anywhere else on Koh Rong Sanloem. One of the most popular options is the Fishing Hook, which offers an all-you-can-eat buffet for just $6 every evening. You can feast on made-to-order Khmer BBQ, with seafood, meat, and veggie options. The Fishing Hook is a great choice for vegans and vegetarians — they have a wide selection of food that is meat-free, both as part of the buffet and on the separate a la carte menu. Every evening at the Fishing Hook they use a projector to screen a movie onto the building next door — when we were there it was a documentary about sea life. At the end of the dinner service all unsold meals are offered to the locals from the village, who often come by to enjoy dinner and a movie. 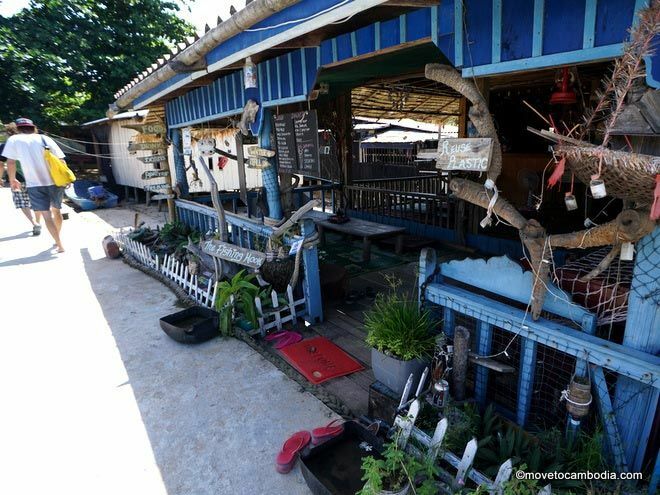 The Fishing Hook offers some of the best eats in M’phey Bei. The Drift has a family-style dinner every night at 7 p.m. (although it’s best to reserve a spot earlier in the day, as they only serve dinner if there’s enough interest). The cost is $3 or $4 and there are always vegetarian options. In addition to the family dinner, the Drift also has an a la carte menu and is known for its build-your-own burgers — both beef and veggie. Dinner at the Drift is a great way to meet other travelers, and they also have a happy hour from 5 to 7 p.m. with $0.75 Klangs and $1 whisky and Cokes. The Blue Quay serves up a mean pizza, according to the expats on the island, and Sunset Beach Resort is known for its menu of European fare — we tried a pasta dish that was surprisingly good. Easy Tiger has nice Western breakfasts and a regular Indian curry night (in the UK style) that gets rave reviews, and it’s a nice spot to enjoy a few beers in the afternoon. If you’re looking for more local options, check out Mom’s Home Cooking, where you can get a range of Cambodian dishes — but also the ubiquitous Western dishes that can be found anywhere on the Southeast Asia tourist trail, including French fries and pancakes. Everything on the menu is just $2. There are two big tables to be shared, and Klangs — M’phey Bei’s favorite beer — only cost $0.75, so it’s a good place to meet other backpackers on a budget. Kiki Restaurant offers pretty much the exact same thing as Mom’s Home Cooking — although reportedly not as good — with a large menu of Cambodian and Western dishes for just $2 each. The restaurant is also sometimes called My Home, and they serve fried noodles, fried rice, and the like until 10 p.m. every night. Sundowners at Dragonfly with a side of eye candy. If you’re looking to knock back a couple of drinks, head to Dragonfly. They’re up the hill but it’s worth the walk to take in the stunning sunset views at their bar and communal area overlooking the water. On the other hand, the beachside bar at the Chill Inn, otherwise known as the Skulking Pikey, pretty much serves until the last customer leaves…or falls down. The place is popular with the island’s expats, who can be found there of an evening mingling with backpackers and sometimes locals from the village. The drinks are cheap, the tunes are good, and it’s definitely worth a visit. Because there are so few businesses on Sunset Beach, the options are limited. That being said, Huba Huba has not one but two bars, including a beachside bar in the shape of a boat and sunset happy hour specials from 4 till 6 p.m. They have evening specials, including seafood BBQs, poker night, Khmer buffets, reggae night, and movies on the beach. They serve breakfast, lunch, and dinner and offer a range of Cambodian, European, and fresh seafood dishes. Sleeping Trees has a large bar with a pool table and a restaurant that serves a range of the typical Cambodian and Western dishes, including fried rice, fried noodles, burgers, and salads as well as inexpensive beers and cocktails. Lazy Beach has great food, which is a good thing, because if you’re staying there you’ll be too far away to eat anywhere else! Typically when you see a large menu in Cambodia it’s a bad sign, but despite having an extensive array of Western and Asian dishes, Lazy Beach manages to keep the quality high. Portions are big and the Western menu reflects the tastes of the UK owner — there’s a ‘battered and fried’ section. Seafood can be ordered a day in advance from one of their fishing boats, and there are also nighttime BBQs. Vegetarians won’t be disappointed, either, as there are many options for veggie lovers.